INDIANAPOLIS — A woman accused of driving drunk and killing a 66-year-old Noblesville man was sentenced to four years in prison Wednesday after agreeing to a plea deal. Elizabeth Vargas-Hernandez, 35, was charged in February with operating a vehicle while intoxicated, operating a vehicle without ever having received a license and causing death when operating a motor vehicle while intoxicated following a fatal crash on I-465. Indiana State Police say Vargas-Hernandez was driving on I-465 just before 2:30 a.m. on Feb. 13 when she rear-ended a vehicle driven by David Kriehn, 66, of Noblesville, near Michigan Road. Kriehn was ejected from his 2002 Honda as it rolled into the ditch. He was transported to St. Vincent Hospital, where he died from his injuries. Vargas-Hernandez’s vehicle also inverted into the ditch. Amazingly, neither she nor three passengers in the vehicle with her at the time of the crash were injured. On Wednesday, Vargas-Hernandez entered a plea of guilty to one count of causing death while operating a motor vehicle with a blood alcohol content of .15 or greater. A Marion County judge sentenced her to four years in the Indiana Department of Correction. She will also be unable to receive a driver’s license for 10 years. Vargas-Hernandez could also potentially face deportation upon her release from prison, as police believe she is an undocumented Mexican national. A car stopped in the Town of Wethersfield with no windshield, doors or a license plate and with an ax in the roof led to the arrest of the driver on charges of driving while impaired by drugs, the Wyoming County Sheriff’s Office said Tuesday.After receiving a report about a “suspicious vehicle” on Monday, deputies pulled over a car with many missing parts driven by Jared T. Price, 21, of Java, at the intersection of Younger and Wethersfield roads, the sheriff’s office said.”Price performed poorly on field sobriety testing and was taken into custody,” according to a sheriff’s office news release.Price was taken to the sheriff’s office for a drug influence evaluation and a certified Drug Recognition Expert found him to be “impaired by multiple different drug categories,” officials said.ADVERTISEMENTJared T. Price (Provided by Wyoming County Sheriff’s Office)He was charged with driving while ability impaired by drugs, driving while ability impaired by the combined influence of drugs and numerous traffic infractions, including operating a vehicle without insurance.Price was arraigned in the Town of Gainesville Court where bail was set in the amount of $10,000 cash bail or $20,000 bond. He is scheduled to appear Aug. 1 in the Town of Wethersfield Court. John Bowlen, son of Broncos owner Pat Bowlen, arrested on suspicion of DUI in CaliforniaMark Belcher10:40 AM, Jul 31, 20176:50 PM, Jul 31, 2017nfl arrests | broncos news | john bowlen arrested | son of broncos owner arrested | pat bowlen son john bowlen Autoplay:PauseMuteLoaded: 0%Progress: 0%Remaining Time -1:29CaptionsFullscreenSHOW CAPTIONPASO ROBLES, Calif. — The son of Pat Bowlen, the owner of the Denver Broncos, is facing charges in California over driving under the influence. Police in California arrested John Bowlen Sunday afternoon and booked him into the San Luis Obispo County Jail.According to police records, Bowlen faces two charges related to driving after drinking alcohol, including Driving with BAC .08 or Higher and Driving Under the Influence of Alcohol. Those charges are booked as 23152(A) VC and 23152(B) VC. Police in California say they do not release arrest reports, but Denver7 is working to obtain the records. It’s not the first time Bowlen has been in trouble with the law.He was found guilty in April 2016 of harassing a girlfriend the year before, and was sentenced to 24 months of probation with drug and alcohol evaluation. He was also ordered to undergo a mental health evaluation and treatment.He’d originally been charged with two domestic violence counts in that case after his girlfriend called 911 on him because he was inebriated, and he followed by shoving her against a wall, according to police reports.He also pleaded guilty to driving while ability impaired in August 2005, according to Colorado court records.A spokesperson for the Broncos could not provide a comment concerning the arrest, citing “a personal matter for John, who is not employed by the team. Although consuming cannabis is legal in Colorado and several other states, driving while under the influence of the drug is not. “It’s a brave new world,” said instructor Chris Halsor, referring to the years since Colorado legalized recreational marijuana. There are now more marijuana dispensaries in Colorado than there are Starbucks shops, said Halsor, a Denver lawyer and former prosecutor. And though consuming cannabis is legal across the state, driving under its influence is not. The cops in that conference room, with their buzz cuts and Mountain Dew, are all part of the force charged with keeping the roads safe. But first, they needed a formal pot education — to learn how to identify various marijuana products and paraphernalia when they pull over a driver they suspect is under the influence. Here’s the rub: Despite the increasingly legal use of cannabis in many states, cops still don’t have the equivalent of a reliable alcohol breathalyzer or blood test — a chemically based way of estimating what the drug is doing in the brain. Though a blood test exists that can detect some of marijuana’s components, there is no widely accepted, standardized amount in the breath or blood that gives police or courts or anyone else a good sense of who is impaired. Yessenia Hinojos, a budtender at a Denver cannabis dispensary called The Green Solution, describes marijuana strains to A.J. Tarantino (left) and Philip Gurley. Both men are officers with Colorado State Patrol. A number of scientists nationally are working hard to create just such a chemical test and standard — something to replace the behavioral indicators that cops have to base their judgments on now. “We like to know the human error and the limitations of the human opinion,” said Tara Lovestead, a chemical engineer at the National Institute of Standards and Technology in Boulder, Colo., who is working on setting standards for what a marijuana detection test might require. It’s actually really hard for Lovestead to do this kind of research because she works in a federal lab; federally, cannabis is considered a Schedule 1 substance, “a drug with no currently accepted medical use and a high potential for abuse.” So even though Lovestead is in Colorado, getting hold of a sample for research purposes is just as hard as getting hold of heroin. “We cannot use the stuff down the street,” she said. Aside from being a bureaucratic mess, coming up with a standardized blood or breath test is also a really tricky chemistry problem because of the properties of the main psychoactive chemical in cannabis: delta–9-tetrahydrocannabinol, or THC. In states like Colorado, there is a THC blood test that law enforcement can use to show “presumed” impairment. If a person has more than 5 nanograms of delta-9-THC per milliliter of blood, it can be “presumed” that they are impaired, according to Colorado law. But Lovestead and others maintain that, scientifically speaking, that cutoff doesn’t actually mean anything. Turns out it can be a lot harder to chemically determine from a blood or breath test that someone is high than to determine from such a test that they’re drunk. Ethanol, the chemical in alcoholic drinks that dulls thinking and reflexes is small and dissolves in water. Because humans are mostly water, it gets distributed fairly quickly and easily throughout the body and is usually cleared within a matter of hours. But THC, the main chemical in cannabis that produces some of the same symptoms, dissolves in fat. That means the length of time it lingers in the body can differ from person to person even more than alcohol — influenced by things like gender, amount of body fat, frequency of use, and the method and type of cannabis product consumed. In one study, researchers had 30 frequent marijuana users stay at a research facility for a month without any access to drugs of any sort and repeatedly tested their bloodfor evidence of cannabis. “And it shocked everyone, including ourselves, that we could measure, in some of these individuals, THC in the blood for 30 days,” says Marilyn Huestis, a toxicologist with the University of Maryland School of Medicine who recently retired from leading a lab at the National Institute on Drug Abuse. The participants’ bodies had built up stores of THC that were continuing to slowly leech out, even though they had abstained from using marijuana for a full month. In some of those who regularly smoked large amounts of pot, researchers could measure blood THC above the 5-nanogram level for several days after they had stopped smoking. Conversely, another study showed that people who weren’t regular consumers could smoke a joint right in front of researchers and yet show no evidence of cannabis in their blood. So, in addition to being invasive and cumbersome, the blood test can be misleading and a poor indicator of whatever is happening in the brain. Recently, some scientists have turned their attention to breath, in hopes of creating something useful. A number of companies, like Cannabix Technologies and Hound Labs, are in the process of developing breath detection devices. Tara Lovestead is providing the data that will help relate the concentration of THC detected in the breath to what’s in the blood. Even though blood provides an incomplete and indirect inkling of what’s happening in the brain, it’s the measure law enforcement turns to as a benchmark. That, too, is a chemist’s nightmare. THC and other cannabinoids — the chemicals that cause a high — are really squirrelly. They degrade quickly and appear only in very tiny amounts in the breath. Luckily, Lovestead’s specialty is detecting tiny amounts of chemicals in the air. She and her colleagues have worked on methods to use tiny air samples to detect evidence of arson, buried bodies and hidden explosives. Marijuana is the next challenge. In the future, she said, an accurate breath test would likely involve looking at a lot more than just THC — probably a whole combination of chemicals. “One thing to look for would be metabolites — something that comes out of the breath that shows it actually went through your system,” she said. Such a test would greatly reduce the possibility that someone might test positive from inhaling secondhand smoke, she said. In the meantime, it’s up to law enforcement officers like the ones in Chris Halsor’s class to make the call, based on circumstantial evidence and their best guess. “The whole point of this class is to get the officers to make correct decisions,” said Halsor. The cops attending his seminar in the spring paged through Dope Magazine, chuckled at a photo of an edible called “reef jerky” and watched a video together on how to dab — heating concentrated marijuana and inhaling the vapors. In their visit to a local marijuana dispensary, they examined gold-plated blunts — hollowed-out cigars filled with marijuana. But the real test of these officers’ ability to identify the signs of cannabis impairment faced them outside the hotel, in a parked RV that was plastered with bumper stickers. A chemical test that reliably detects cannabis use — let alone intoxication — has been elusive. Four volunteers for the project were inside the RV, legally getting as high as they wanted to, from a big plastic tub full of pot products. “Good music, good company, good weed. It all goes together,” said Eugene Butler, one of the four volunteers. Butler and the three others had never met before. They had volunteered to get high and then interact with cops to help the officers learn the signs of cannabis impairment. “We’re going to willfully smell like pot around a bunch of cops,” said Sharica Clark, laughing. Inside the hotel, the officers practiced roadside sobriety tests on the four volunteers — determining each time if, in real life, they would have arrested these people for a DUI. All the volunteers had smoked a lot of pot inside the RV. But in the sobriety tests, they performed differently. A volunteer named Christine, for example, did well on math, quickly calculating how many quarters are in $1.75. But she didn’t do well on other things, like balancing, remembering instructions and estimating time. (She was concerned about recrimination at work, and NPR agreed to use only her first name). Christine, the officers all decided, would be a danger behind the wheel. In real life, they would have arrested her. “Yeah, she’d be going to jail,” said Rich Armstrong, an officer with Colorado State Patrol. But things weren’t so clear with the other volunteers. A lot of the officers had decided they wouldn’t arrest Eugene Butler or a volunteer named John (who also asked that we not use his last name); both men aced the same roadside tests Christine flunked, even though they, too, had just smoked a lot in the RV. “It was a tough one,” said Tom Davis, another officer with Colorado State Patrol. Volunteer Sharica Clark counts 30 seconds with her eyes closed, as officers with Colorado State Patrol check her balance and counting skills after using cannabis. It was part of a simulated roadside sobriety test in the officers’ training seminar. Right now, these officer’s opinions loom large. If they decide you’re driving high, you’re going to jail. But at the end of the day, they’re just making educated guesses. Two different officers could watch the same person doing the same sobriety test and make different decisions on whether to arrest. In previous courses, officers had decided that a volunteer was impaired when in fact the volunteer hadn’t smoked at all. So, just like the THC blood test, the judgments officers make can also yield false positives and negatives. “This is one of those subjective areas,” said Armstrong. “It’s too subjective,” said Lovestead. She recently published a paper in the journal Forensic Chemistry where she found the vapor pressure of THC — one of its fundamental physical properties. Lovestead believes finding and standardizing that measurement is a small but significant steptoward a more objective route for evaluating intoxicated drivers. In the meantime, courses like Halsor’s are the best resource for officers. And at least now the class participants know what pot strains like Skunk Dawg, Hippie Chicken and Chunky Diesel actually smell like. A woman was charged with driving while impaired after she crashed into this parked truck outside Catawba Brewing Company on Thursday. Pain pills and marijuana were found inside the vehicle that crashed into this truck outside Catawba Brewing Company on Thursday. Police caught the driver on Kirksey Drive shortly after. A Kentucky woman faces a felony drug charge and a DWI after police stopped her fleeing from the scene of a crash outside Catawba Brewing Company on Thursday. Josh Daves was standing in the gravel parking lot across from the brewery around 7:30 p.m. when he heard a loud crashing sound, he said. He looked over at his Chevy Silverado that was parked on Green Street and saw a Ford Ranger had crashed into it. “I was hoping (the driver) was OK because that was a bad accident,” Daves said. But when Daves ran over to his truck, he said the woman behind the wheel was screaming and seemed ready to drive away . Officer B.M. Linares responded to the scene and eventually located the vehicle on Kirksey Drive, according to a police report. Linares arrested the driver, Ruth Ann Lyons, 54, and charged her with driving while impaired and felony possession of a controlled substance with intent to manufacture after oxycodone, hydrocodone and alprazolam were found in her vehicle, the report said. Daves said he bought his 2014 truck in April, and it was hit by another vehicle two weeks ago. He was prepared to get the earlier incident taken care of on Friday, but the crash on Thursday made his situation even worse. “I finally worked my way up to where I could get a nice vehicle, and this is what happens,” Daves said. Daves estimates about $15,000 worth of damage was done to the truck, which was valued at $32,000 before the crash. Daves is a brewer at Catawba Brewing Company and was working when the crash happened. He said his background in beer makes him even more upset that an allegedly impaired person got behind the wheel. Linares also found marijuana in the vehicle, the report said. Lyons’ additional charges include simple possession of schedule VI narcotics, possession of drug paraphernalia, no operators license, safe movement violation and misdemeanor hit and run. Lyons consented to a blood test before being transported to the magistrate’s office, where she was issued a $20,000 bond, the report said. 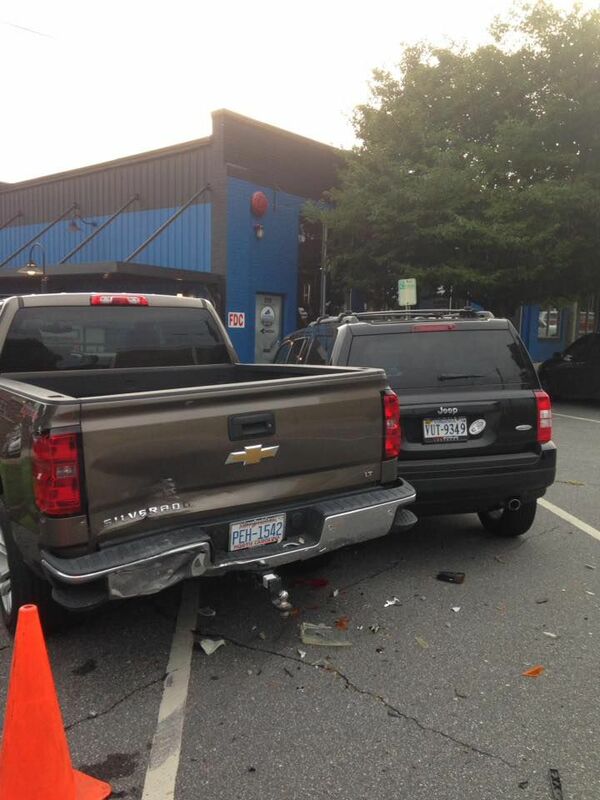 The crash also caused Dave’s truck to hit a Jeep parked beside it. LOS BANOS, Calif. (KRON) — Authorities are investigating whether an 18-year-old Stockton woman live-streamed herself driving drunk Friday in Los Banos. Obdulia Sanchez was later involved in an accident that killed her 14-year-old sister on Henry Miller Rd. around 6:40 p.m.
Sanchez is seen broadcasting herself live on Instagram as she drives down the road and raps along with the music. The video has reportedly been pulled from social media sites, but still managed to get lots of circulation around the internet. In one instance, a girl can be seen in the backseat. Eventually, the video comes to a sudden end in what appears to be Sanchez losing control of the car. Los Banos investigators aren’t confirming the filming of the live video is linked to the fatal crash, but they are investigating the possibility. They do confirm that Friday evening Sanchez was with her 14-year-old sister, Jacqueline Sanchez, and another 14-year-old when she started to leave the roadway, over-corrected, and crashed. Neither of the 14-year-olds were wearing a seat belt. Both were thrown from the car and Jacqueline Sanchez died at the scene. The other 14-year-old passenger suffered what authorities call “severe trauma” to one of her legs in the crash. Obdulia Sanchez is charged with DUI and gross vehicular manslaughter while intoxicated. She has not, however, been charged with using her phone while driving. Still, the video remains as a stark reminder of the dangers of not just driving intoxicated, but distracted driving. 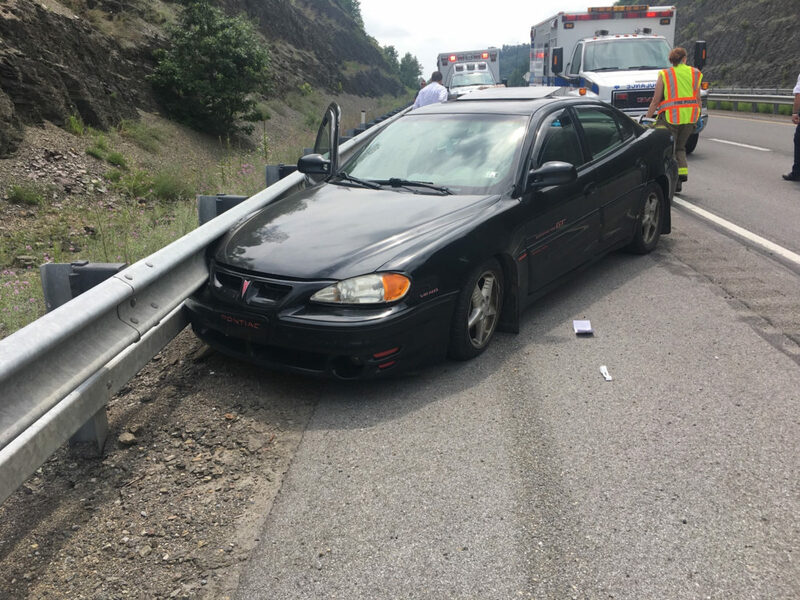 A Trout Run woman driving this car admitted that she “used two bags of heroin” minutes before she crashed into a guardrail in the 7500 block of Route 15 in Lycoming Township about noon Thursday, according to Old Lycoming Township Police Chief Joseph Hope. The woman’s juvenile son, riding in the vehicle, escaped injury, Hope said. The woman was taken to a local hospital and later released. Her name will be released when charges are filed, Hope said. About 10 minutes before this crash, another woman suffered a suspected heroin overdose as she crashed her Honda Element into a parked van on Boyd Street, city police said. She too was taken to the hospital and released. Charges are pending against her as well, police said. Troy police arrested a 25-year-old Royal Oak woman for operating a vehicle while under the influence of narcotics with her 10-month-old daughter in the back seat.Officers responded to the area of Livernois and Maple roads at about 5:45 p.m. Sunday, July 23, on a report of a gray 2002 Mercury Sable being driven erratically.Officers saw the car enter the Citgo gas station at 1654 Livernois and spoke with the woman. Police say the woman was unsteady on her feet and had slurred speech. She had the prescription drugs Xanax and Norco in her purse.Officers asked her to perform several field sobriety tests and reported that she performed poorly.She was arrested and taken to the Troy lock-up facility where she agreed to submit to a blood test.She was charged with child endangerment and operating a vehicle while under the influence of narcotics, pending laboratory results. JEFFERSON COUNTY, Colo. — A dozen drivers were busted for driving under the influence of alcohol and/or drugs during one night in Jefferson County, the Colorado State Patrol said Monday. “Drive impaired, expect to be caught, Jeffco agencies will be out in force,” the CSP warned Saturday. The Heat Is On in Jefferson County tonight !! Multiple agencies are coming together to make your roads safe. Less than two hours later, officials said they’d already caught two people suspected of driving under the influence. “Two people already in custody for DUI/D. You start early, perfect, we will find you,” the CSP tweeted. By the end of the night, officials said they’d stopped 13 impaired drivers — including one who had a child in the car. Monday afternoon, the CSP said the final count was nine arrests for DUI, three arrests for DUID and six arrests for misdemeanors. “We all worked hard to keep Jeffco safe,” the CSP said. 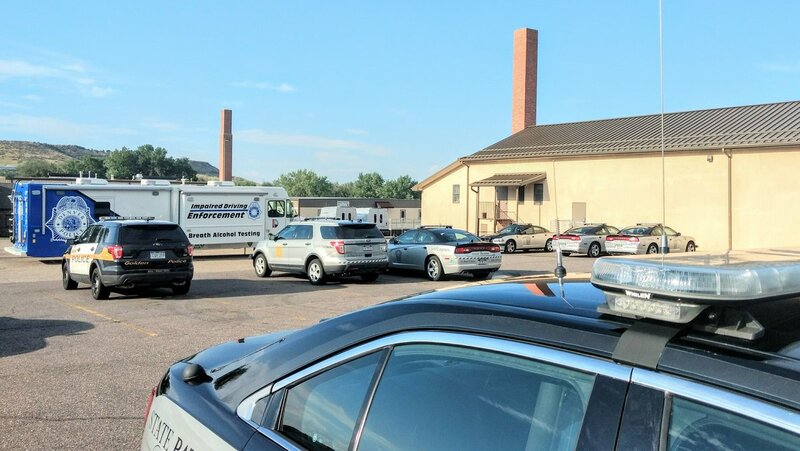 The saturation patrols involved the CSP, the Jefferson County Sheriff’s Office, the Arvada, Wheat Ridge, Lakewood and Golden police departments, and the Foothills Fire Department. BILLINGS, Mont. (AP) — A Billings man charged with vehicular homicide while under the influence of marijuana is challenging the state standard at which a person is considered to be under the influence. Public defender Gregory Paskell says the THC blood level set by the state is arbitrary, and he’s asking that the charge against Kent Roderick Jensen be dismissed. Jensen, 20, is charged in the March 2016 death of motorcyclist Jashua Fry, The Billings Gazette (http://bit.ly/2uihlM3 ) reports. Court records say Jensen pulled out onto a road without seeing the motorcycle, causing the fatal crash. Jensen’s blood contained 19 nanograms per milliliter of THC, the active ingredient in marijuana, court records said. State law says a person is under the influence with a blood level of 5 ng/mL of THC. Paskell cited studies that have concluded it’s difficult to standardize the amount of THC that creates impairment because it varies from person to person. “There is no science to back up the 5 ng/mL level as a level that indicates impairment in a sizable enough portion of users to make it a standard for everyone,” Paskell wrote. Deputy Yellowstone County Attorney Victoria Callender said the Legislature, which makes policy decisions, set the legal limit based on research and that the case should move forward. Montana is one of 18 states with marijuana-specific impaired driving laws, according to the Governors Highway Safety Association. A dozen states have zero tolerance for marijuana or its metabolites. Colorado, Montana and Washington’s driving limits of 5 ng/mL are the highest among the six states that list legal limits. Colorado allows defendants to argue they were not impaired at that level, but Montana and Washington laws are similar to blood-alcohol limits, which drivers cannot challenge. District Judge Gregory Todd heard arguments on June 2 and then received written briefs. He has not ruled in the case. Jensen’s trial is scheduled for late August.